Former FBI Director James Comey told Congress that the Trump administration’s comments about him and the agency were “lies plain and simple”. James Comey told a Senate committee they were wrong to denigrate the FBI and its leadership. The ex-FBI chief was also “confused” by the “shifting explanations” for his sacking, which came as he led a probe into any links between the Trump campaign and Russia. President Trump later said he never sought to impede the inquiry. Donald Trump’s attorney, Marc Kasowitz, said in a statement James Comey’s testimony “finally confirmed publicly” that the president was not under investigation as part of any probe in Russian political meddling. In the statement, President Trump also denied asking James Comey for his loyalty or to drop an investigation into fired national security adviser Michael Flynn during private meetings. In his testimony, James Comey said President Trump had repeatedly told him he was doing a “great” job. The former FBI chief also suggested he was fired to “change the way the Russia investigation was being conducted”. He remained largely composed throughout almost three hours of testimony but became impassioned when delivering his opening remarks. James Comey told the panel that the White House “chose to defame me, and more importantly the FBI” by claiming the agency was “poorly led”. “Those were lies, plain and simple. And I’m so sorry that the FBI workforce had to hear them,” James Comey continued. James Comey was leading one of several Russia investigations before President Trump fired him. US intelligence agencies believe Moscow interfered in the US election and they are investigating alleged links between the Trump campaign and Russia. However, there is no known evidence of collusion and President Donald Trump has dismissed the story as “fake news”. He said he it was not for him to say whether Donald Trump’s actions were an obstruction of justice. Democratic Senator Mark Warner, the committee’s vice chairman, pressed James Comey on why he decided to keep a record of his conversations with President Trump. James Comey, who published his prepared remarks a day before the hearing, detailed one meeting with Donald Trump in which the president asked Attorney General Jeff Sessions and White House aide Jared Kushner to leave the Oval Office. “I knew something was about to happen that I needed to pay very close attention to,” James Comey said. During another meeting with Donald Trump, James Comey said the president appealed to him to “let go” an investigation into fired national security adviser Michael Flynn and his ties to the Kremlin. After media reported the conversation, the president warned James Comey in a tweet, saying he “better hope there are no <<tapes>> of our conversations”. James Comey told the committee he hoped there were tapes, calling on President Trump to release them. After President Trump’s tweet about potential tapes, James Comey said he realized it was important to release his own account of the story. James Comey revealed that he asked a “good friend of mine” who is a professor at Columbia Law School to share contents of the memo with a reporter, in order to build pressure for a special counsel. As a result of this episode, former FBI chief Robert Mueller was appointed as special counsel to lead an independent investigation into the Trump campaign’s potential ties to Russia. James Comey said he was “sure” Robert Mueller was also looking at whether President Trump obstructed justice. 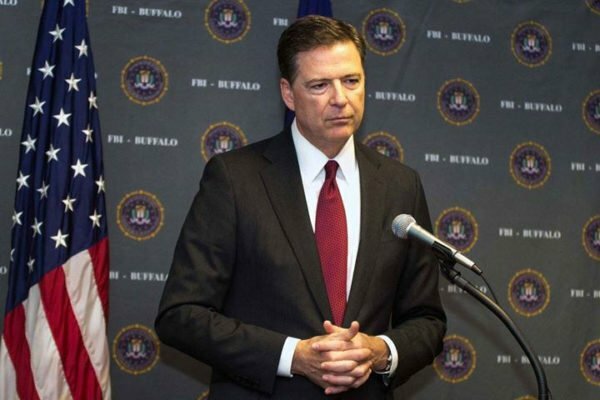 Donald Trump attacked James Comey for leaking the documents, saying it showed that members of the US government are “actively attempting to undermine this administration”.